We’d love your help. 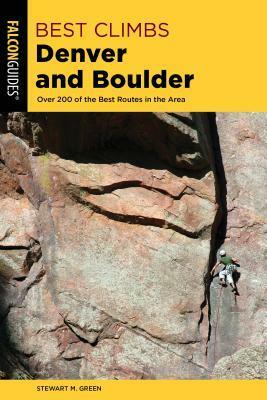 Let us know what’s wrong with this preview of Best Climbs Denver and Boulder by Stewart M. Green. To ask other readers questions about Best Climbs Denver and Boulder, please sign up. I've been a freelance photographer and writer since 1977, based in Colorado Springs and traveling all over the great American West as well as the rest of the United States and the world in search of memorable images and experiences to write about and to lead people toward. Since the mid-1980s I've worked as a contract photographer and writer for FalconGuides/Globe Pequot Press, writing 25 books an I've been a freelance photographer and writer since 1977, based in Colorado Springs and traveling all over the great American West as well as the rest of the United States and the world in search of memorable images and experiences to write about and to lead people toward. Since the mid-1980s I've worked as a contract photographer and writer for FalconGuides/Globe Pequot Press, writing 25 books and photographing a few more. My books include Rock Climbing Colorado, Rock Climbing Europe, Rock Climbing Utah, Rock Climbing Arizona, Rock Climbing New England, Best Hikes Near Colorado Springs, Scenic Routes & Byways Colorado, Scenic Routes & Byways New England, Scenic Routes & Byways California's Pacific Coast, Scenic Driving California, Scenic Driving Arizona, KNACK Rock Climbing, Best Climbs Moab, Best Climbs Denver and Boulder, Rocky Mountain National Park Pocket Guide, and Back Country Byways. My work has also been published in lots of other national and international publications, books, magazines, catalogs, and advertisements. Along the way I fathered a couple of amazing kids--Ian and Brett Spencer-Green, climbed and adventured in a lot of places around the world that I never could have imagined, and had loads of fun. I've kept my hands busy and my heart full. I'm grateful for that. I write and photograph because of what is in front of me, to honor everything beyond in the world which is great, interesting, mysterious, and always changing. To be a writer and photographer is to see newly every day, as if for the first time, the essence that illuminates and lives within the earth. Every subject redefines me and allows me to discover harmony, reconcile disparities and inequities, and to find shape, symmetry, and truth in the chaos of life.